It’s 7 p.m., the sun’s still out and it’s 85 degrees. Do you really want to spend the night in front of the stove? (We didn’t think so.) These 50 easy-breezy dinners take just a few minutes to whip up and don’t use every single pan in the kitchen. Corn, bacon and just a touch of Parm = completely irresistible. Now this is what we call a dinner salad. Best of all, there’s no cleanup. An easy but impressive way to feed a crowd. Smashed avocado and spicy mayo take these family-friendly sammies over the top. This one-pan wonder cooks for 30 minutes. It tastes like you spent hours making it (hint: you didn’t). It’s totally OK to use your grill pan. Juicy fruit pairs magically with chicken thighs. Way more interesting than ground beef. If it were up to us, every recipe would be this darn easy. No pots or pans required. Throw all of the ingredients in the pot and boil ’em. Roasted cucumbers are so in right now. Best of all, you can make this dish for about ten bucks. PureWow Coterie member Jess Larson shares our love of hearty bowls. Beautifully seasoned, just like a filet mignon. Coterie member Phoebe Lapine gives you permission to throw in any veggies you have on hand. Ah, puff pastry: So impressive-looking, but so easy. Yes, you can (and should) use your slow cooker in the summer. PureWow Coterie member Maria Lichty brings us the magic of no-cook. Thy farmers’ market market haul. The summer equivalent of a casserole. It’s totally foolproof, we promise. The creamy dipping sauce is everything. It’s a midsummer night’s dream. We love our favorite veggie’s summer look. The easiest way to feed a crowd. It’s begging to be enjoyed alfresco. Nutty sorghum pairs gorgeously with ripe, raw veggies. The whole fam will be obsessed. Best of all, it’s totally make-ahead. PureWow Coterie member Aida Mollenkamp knows how to make a dinner-worthy stack. So much more interesting than jarred marinara. A speedy dinner for when you’re flying solo. 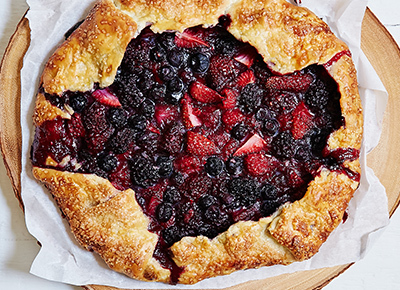 Store-bought dough makes this pie a breeze. We love making our main course and sides all at once. Just 300 calories per serving. You only need 15 minutes to create this Mediterranean dinner. The filling’s the best part anyway. Straight out of our wildest dreams. These little guys have totally stolen our hearts.